Posted on June 18, 2009 by Nellie Jacobs: Creative Consultant/Coach providing inspiration, motivation, focus and strategies to individuals and groups. Tagged BlogTalkRadiobuying inconnectionscreative thinkingcreativityentrepreneursgoalsicebreakerIgniting ImaginationimaginationInternet radio seriesknowledgelearninglearning matterspossibilitiesrelationships	CommentsNo Comments on Celebrating 2 Successful Seasons!! 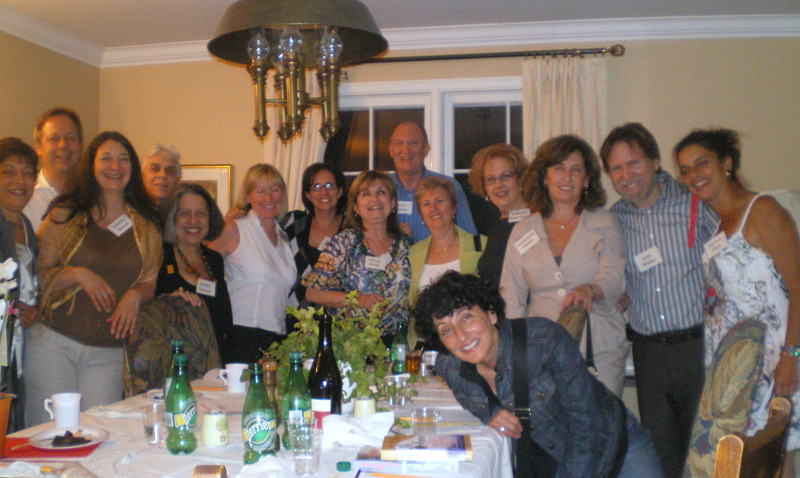 To celebrate the completion of Seasons 1 and 2 of my Internet radio interview series, on June 9th, 2009 I was pleased to host a dinner for 14 show guests who lived in the general vicinity. 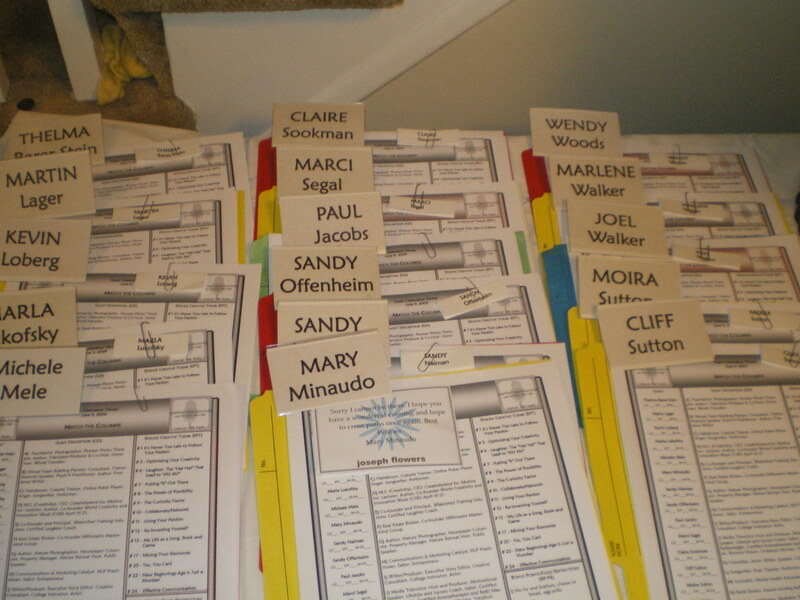 On arrival, each guest was handed a place card with their name to reserve their spot at the dining table, a name tag, a pencil, and a sheet of paper with an icebreaker exercise. Lesson Learned #1: We can have conversations with anyone if only we know what to ask. The purpose of the icebreaker was to (1) give people an opportunity to meet and talk with everyone, (2) demonstrate how each of us has so many points of reference, (3) open the door for interaction and exchange of information, and (4) indicate the various ways we are connected. Lesson Learned #2: If you show a genuine interest, people like to talk about themselves and share their histories. Whether guests were introverted or outgoing all bravely took part, fully buying into the concept. The hour before dinner was filled with laughter and conversation as all were busy talking, sharing, introducing each other and helping fill in the forms. It turned out that many people had much in common, several knew each other previously and some made connections for the future. By the time we sat for dinner, there was such a spirit, laughter and camaraderie that permeated the rest of the evening. 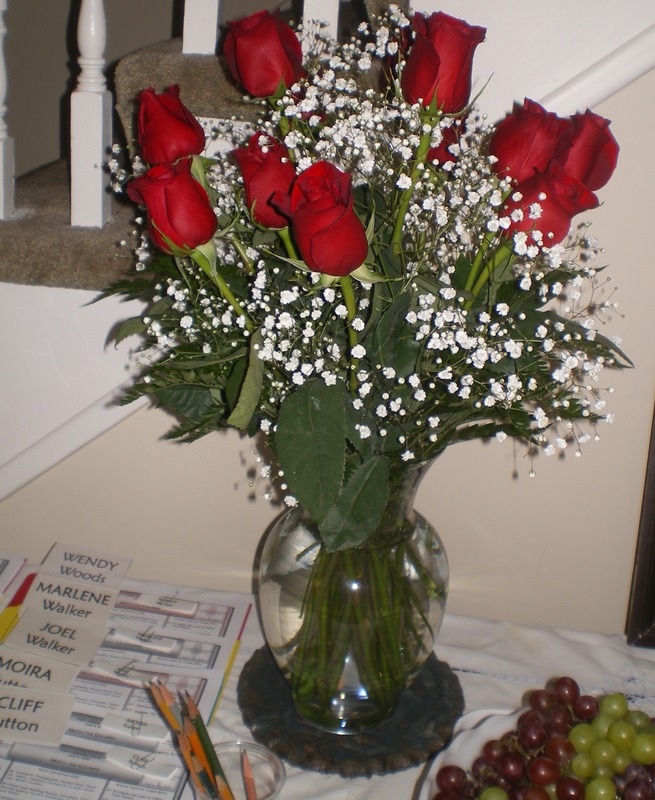 Mary Minaudo sent her regrets and this beautiful bouquet of roses-my favourite flower! Try the challenge. Download the icebreaker: Radio Guest Celebration Dinner-Matching Game. Match the columns. I made the mistake of asking about allergies and food dislikes and received back a considerable list – which became part of the game. Lesson Learned # 3: We’re aware of only a fraction of what there is to know about the people in our lives. How well do you know your family members, colleagues or friends? Interview them and create your own game. If you do it in the style shown here, you can have as many columns and categories as your wish. For example, in one column, list their names. In another, list degrees, qualifications, volunteer or work positions each person has held. In a third, list a current job title or theme and, in the fourth, such items as passions, positive characteristics, favorite pastimes, colours, foods, movies, TV programs or books. Getting to know each other more deeply not only adds to the enjoyment of relationships, but is also a process that can teach us a lot about ourselves. Through her Igniting Imagination programs and services, creativity consultant Nellie Jacobs stimulates creative-thinking, providing tools to individuals, organizations and companies to help ‘mine’ hidden or latent human resources for the personal and professional betterment of all. All Igniting Imagination with Nellie Jacobs talk radio episodes are numbered and archived for your listening pleasure, inspiration and convenience at http://www.blogtalkradio.com/Igniting-Imagination. Seasons 1 and 2 guest photos, profiles, topics and links to their episodes are posted on at www.ignitingimagination.com. Just follow the links.